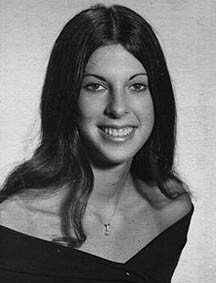 Nancy Paul '75, picture contributed by Bob Fawcett '74. Those who were at Clark in the spring of 1973 got to see the POWs come home. (I missed that by about 4 months). During 1974-75, we got to see the downfall of Saigon proceeded by the Operation Babylift (I think that was what it was called - the evacuation of orphans from Vietnam to the US) and the refugee evacuation. I was just recently helping my grandmother move. She gave me a graduation announcement I'd sent out. Does everyone remember that we all got graduation calling cards made of bamboo? Hi John, My father was statiioned at Clark from 1965 to 1968, then again from 1969 to 1973. My brother, Ed Miller, and sister, Pam Miller, graduated there, and I attended through my sophomore year. As is the plight of so many military brats, I have lost contact with people and wonder where they are at and what they are doing. I don't know if your site makes provisions for this, but I would be interested. For anyone, Every day when I get my e-mails (usually several times a day), I reflect on the friendships formed on this list. I think about how everyone sticks together no matter the age, distance, year of graduation, etc. I am constantly amazed at the way everyone rushes to help when someone asks. I've seen several people receive assistance from all of you when needed...of which I am one. (Jim Kent immediately responded to my plea for paper money from the PI when I needed it for my Girl Scout "thing".) You all are so trusting; quite different from the big ol' world out there! I'm also amazed at how many different types of jobs and "fields of expertise" you all have. Everyone is so grown up. (That last comment was definately tongue-in-cheek <new abbrev. TIC>) I'm saying this because you all have given me a new outlook on life...the outside life and also made me realize that being a military brat gave me something else that all those civi-kids didn't get. I learned respect, a sense of responsibility, honour, love for my country, and dedication. I also received the gifts of making lots of friends in different places all over the world, traveling all over the country & overseas, no fear of new faces or places! How many civi's can say this? I've been in Arizona for 24 years. I have friends that I've known for 24 years (wow!) These friends are messed up. They've never been out of this state, away from their parents. They are mixed up with drugs (major), have tons of kids on welfare (and think it's ok), no jobs, no respect for anyone or anything. I've lost all these friends over the years. I still hear from them (when they need something) but I have no "kinship" with them and don't want any! I feel like I'm the only one who grew up and became a responsible adult. At least among my friends I am. It's so nice to leave the outside world, come into my computer world and talk with you all. Now, I know that most of you would be insulted that I would say that you were "all grown up". Especially when we revert to being 16 again on this list! But, you know what I mean. I also know that not all military brats fared so well. The ones that count did, or you guys sure put on a good act. haha!!! Sorry this got so long, I've been thinking these things for a while and wanted to share. Bye.